Hitler is Alpine, the second fellow looks like an Italian Dinaric (which to me personifies the roman senator look), third one I don't know and the fourth guy has the heavy browridges and and unibrow of a Greek. How about this ones ? Pease make also the comment can this people be considered Aryan by your standards? Streicher is Sub-Nordic or possibly Noric. 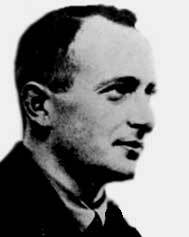 Eichmann seems Dinaric/Alpine or perhaps Keltic/Alpine. Of all the National Socialists posted, I would say only Hitler and Streicher are pretty clearly Aryan; Goebbels is borderline; the rest I would have to say are not. Himmler certainly was not, so it was ironic that he was the man in charge of Aryan racial purity. Last edited by Ominous Lord Spoonblade; Thursday, February 6th, 2003 at 06:03 AM. Hitler was predominantly Keltic perhaps SLIGHTLY altered by alpine. We already classified him in another thread. Why do we have to keep going over this? HE WAS NOT ALPINE! Especially not with his nice blue eyes. Compare him to real Alpines. But I think Hess was Phalian with only slight med admixture. And YES I do consider all of them to be Aryan. Last edited by GreenHeart; Thursday, February 6th, 2003 at 06:16 AM. Hitler = Sub-Nordic, but with the Nordic predominating. Goebbels = Mainly med. Maybe a little Nordic, but the med predominates. Himmler = Dinaric/Alpine, like others say, but with some slight mongoloid admixture. Hess = I agree with NP88...but does anyone know his height/weight? EDITED TO ADD: I take it back! Eichmann was mainly Nordic. Last edited by Azdaja; Thursday, February 6th, 2003 at 07:08 AM. It seems they are not 100% pure Aryans. Or this Old-timers had some seriously different standards on racial purity than various McCulloch characters. Aren't Nordics suppose to be organizers and leaders? How is this possible that a TEUTON Nation was ruled by Non-Nordics? Please post some typical Nordic prominent people from the Third Reich elite. Except Reinhard Heydrich I cant dig out a single one.